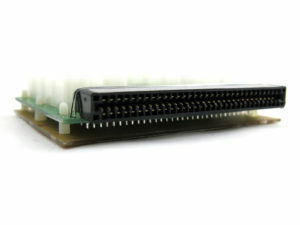 X8 16 Port Breakout Board Adapter Compatible With HP, Delta, Dell 750w / 1100w / 1200w / 1400w/ 1500w/ 2400w Power Supply. Power supplies capable of 2400 watts output can sell for hundreds of dollars. While all are third-party names and often low quality made in China, server accessory excess allows the market to acquire original TOP QUALITY power supplies at a fraction of the cost. 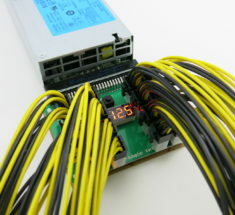 The problem with server power supplies is their proprietary connectors. 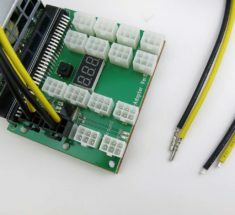 The X adapter solves this problem and allows the power supply to be used for other applications such as Crypto mining, RC hobby, drones or and powering high current 12v devices. Combined with the quality of an HP, Delta, or Lite-On server power supply, the X-Adapter REV8 was made to withstand harsh environments of ASIC miners 24/7. One of the boards shows me only green light and 12.7 volts. The other one show green + orange light, with 12.5 volts on it. 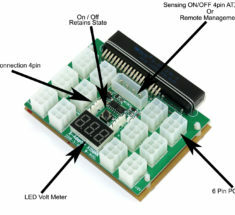 Please, assist me with the indication of the leds. You must be using it on a 2400watt PSU! Amber light indicate there is AC power to the power supply / Green indicate power supply is on. 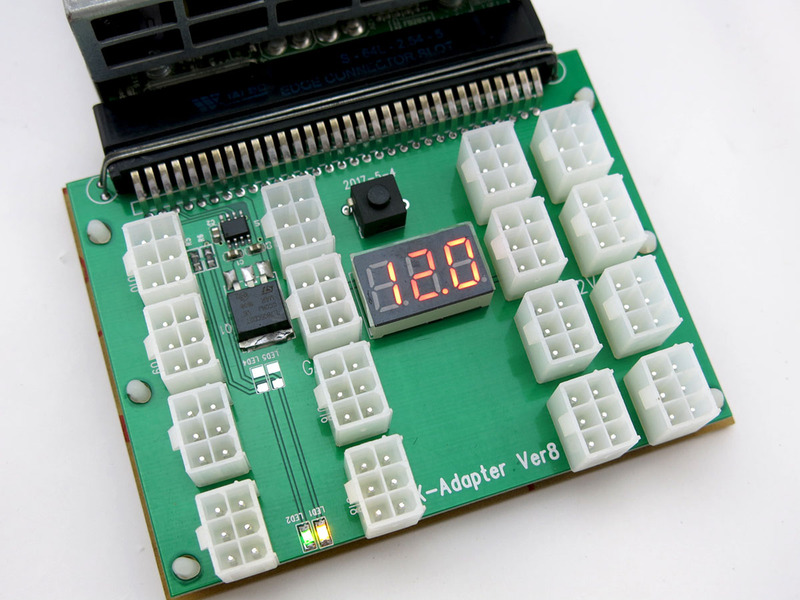 The 2400 watt PSU is rated at 12.5 and the LED voltmeter on the board is not precise unless calibrate. Since the 2400watt PSU have one bar master and one bar slave, your seen the amber light on the master side. I have the same issue…amber yellow light on the breakout board connected to a 2400w Delta psu. Nothing when I hit the power button on the breakout board. What does the amber light indicate? Do I have the breakout board on the wrong side of the PSU? The breakout board should be installed onto the right slot of the power supply. So if you are looking at the power supply and the power cord is in the back, you want to attach the X8 breakout board to the power slot located on the right of the power supply. Or if you have two breakout boards installed on both slots, the power button on the right board will control the on/off feature of both x8 boards. We haven’t sold the 2400watt since NOV 2017, In any-case here some info. The 2400 as two power bar. One is master the other is slave. Only the Master side control the on/off. If one side does not work try the other. Amber light mean there is AC power to the power supply. 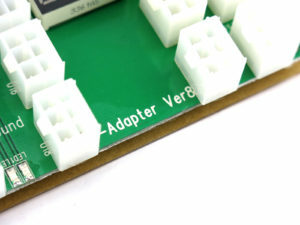 This breakout board support the following PSU model? 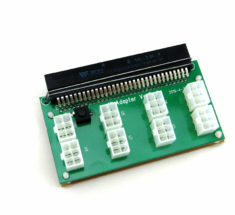 Hello Joseph, I have a concern, today I’m using a similar breakout board to this in my rig, it is from DeepInTheMines. For an unknown reason, the PC shutdown and the PSU connected to the motherboard is a consumer grade one, Seasonic 850W to be specific. Since the motherboard was turned off by this shutdown, the server PSU was still on and so the the GPUs, when I noticed this I touched to GPUs and they were pretty hot because the GPU fans were not spinning, luckily I shut off the server PSU from DeepInTheMines manually and now the GPUs were resting. How I can prevent this from happening with this breakout board that I just purchased? 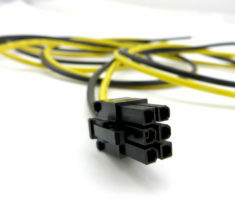 I’ve been seeing that you can interconnect two consumer grade PSUs, so whenever the motherboard is shutdown, the secondary PSU gets shutdown as well and so their GPUs connected. I’m worried that when I leave my rig unattended for a long period (days) they could get burned :(. Replying to my own situation. Deep in the mines has a pin connector, the one used in the floppy drives, to sync the ATX PSU with the Server PSU, does this breakout board have the same functionality? Not this Model. The X11 which will be release in 10days will have that functionality as well as others. On that note, they copied our design of the X7. That board an exact replica. I see, so it is possible to cancel and change my order with the new board? Nobody is answering mails or phone. New board will not Available until next week. I can cancel and issue a refund if you like on last order ? Joseph, I got my refund! Thanks so much, I’ll patiently wait for the X11 :). Thanks! I have several DPS-800GB-A and I’d like to use three or four of them together. Is it possible to link all 4 of them together with this board and your ATX power kit? Is it compatible with DPS-1200MB-1 PSU? Hey Joseph, what is the advantages of the X11 vs the X8? And what PSUs will work with the X11? 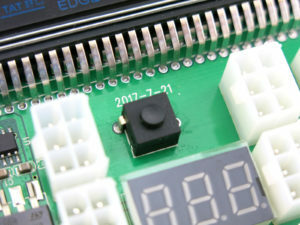 Does this breakout board or the X11 function with an HP 733428-101 (720620-B21)? 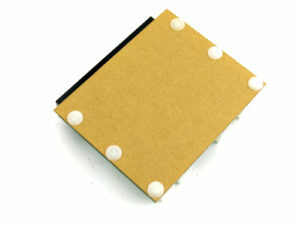 Are these Breakout board compatible with the Delta DPS1200MB A and Delta D1200E-S0? Also when will you have more stock of the HP 1200 Watt Platinum and Gold Rated PSU’s? Can you please advise on the above question. Sorry .. I’m looking at these threads from the back-end and missed this one. The X7 or X8 are not compatible. However the new X11 is. They are a large range of P/N Around Dell / Delta that are compatible. From 1100watt to 1400watt and possibly higher. Thank you kindly sir! Much appreciated. Will this work with HP 498152-001? is this compatible with the HP 643933-001? Does it support platinum 800 watt Delta DPS-800QB A? 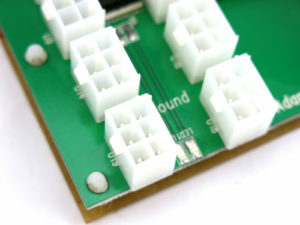 Unfortunately we do not carry any breakout boards that are compatible with a 7 pin slot design that the DPS-800QB uses. 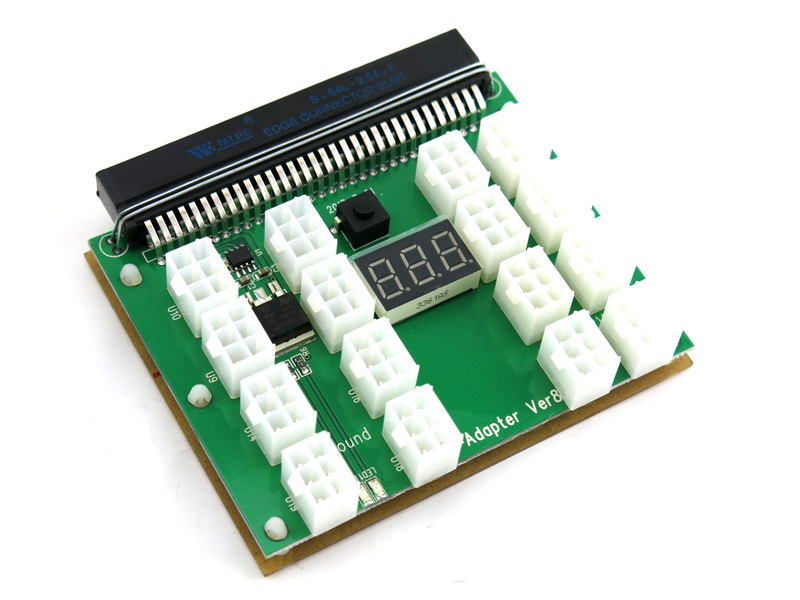 Our breakout boards are compatible with most 6 pin or 8 pin slot models. Please take a look at our compatibility list for more compatible part numbers as the list is fairly up to date. Is it compatible with HP HSTNS-PL11 1200W? I bought it all excited to then realize it’s not on the list…. The breakout boards sold from Parallel Miner are in a class of their own! There are simply NO comparisons whatsoever. 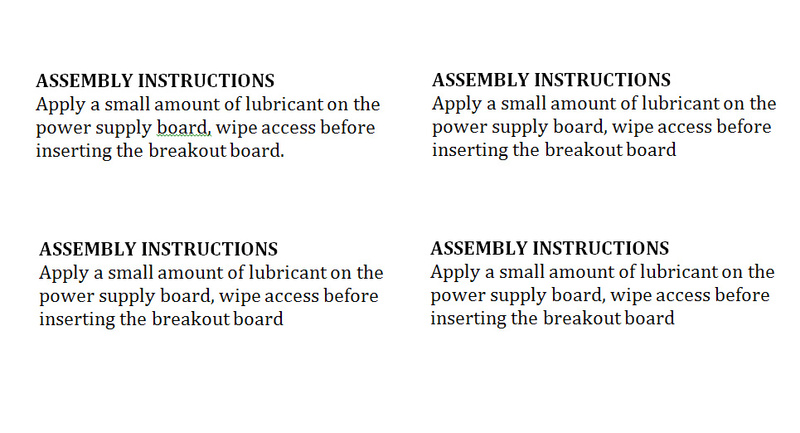 Other boards get dangerously hot and eventually begin turning dark brown to black (and one nearly caught on fire). I will ONLY use boards sold by Parallel Miner, as they can power my higher wattage PSU’s with ease. Beware of cheap knockoffs being sold elsewhere – Parallel Miner/Centrix is the ONLY place to get these genuine, quality boards! Used it on three HSTNS-PL18 which are mentioned in the compatibility list, got fried from the first second each time. I used this board on a 460W (HSTNS-PD14), 750W (HSTNS-PL18), and 1200W (HSTNS-PD19) PSU without issue. It’s a high quality board that I really recommend. Flawless… What more can I say?